The Coalition's deeply-rooted problem with women is worsening, writes John Passant. 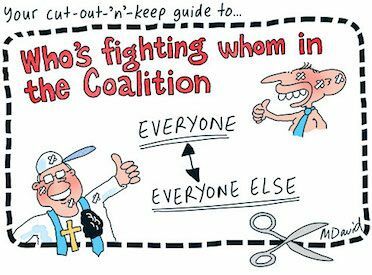 THE FARCE that is politics in Australia continues with the Morrison Government lurching from self-inflicted crisis to self-inflicted crisis. The latest iteration of this political suicide in slow motion was the resignation, on Tuesday, of Member for Chisholm Julia Banks from the Liberal Party and her move to the crossbench. Banks called the Liberal leadership change in August a "coup" and described those leading it as reactionary and regressive. The Liberals are a boys’ own club too — a point Banks made in more restrained terms in her Liberal Party resignation letter. Senior Liberal and Minister for Women Kelly O’Dwyer captured just some of the problems with the Liberal Party when she said they were seen as "homophobic, anti-women, climate-change deniers". As the rout of the Liberals in Victoria, as well as the recent 55 to 45% Newspoll two-party preferred vote for Labor federally show, they also do not resonate with the mass of ordinary working people — who are concerned about low wages, precarious jobs, and failing services like public health, education and transport. Given, the gender pay gap and the over-representation of women in part-time and precarious work, as a generalisation, the current economic malaise is worse for women. For example, women are paid on average about 14.5% less than men. This, by the way, is the lowest the gap has been in 20 years! Women have superannuation balances 47% below that of men. They overwhelmingly fill the lower echelons of most work hierarchies, including the public service. They spend about 20 hours a week in unpaid domestic duties. The burden of childcare usually falls on them. Women are over-represented in poverty and homelessness figures. None of this has changed in any real way under the various Liberal governments in power since the 2013 Election. Yet the Minister for Women Kelly O’Dwyer had the hide to proclaim recently that the Coalition was "the natural government for Australian women". That would be the same Liberal Party that the same Kelly O’Dwyer said was regarded as anti-women, would it? If the Liberal Party is the "natural government for Australian women", why are women fleeing from it? The most obvious example is Julia Banks. She is not the only one deserting the ship of men. Only a few months ago, Liberal Member for Gilmore Ann Sudmalis announced she would be leaving politics because of the "bullying and backstabbing". Banks and Sudmalis are not alone. In Western Australia, for example, polling shows women have deserted the Liberal Party. The gender voting gap between men and women Liberal voters in WA is 10%, meaning that while according to the polling 36% of men will vote Liberal, only 26% of women will. Then there is the question of the number of female members of parliament. If the Coalition is the natural government for women, why are there so few women in this so-called natural government? Out of 83 Liberal MPs and Senators, just 19, or about 22%, are female. That other bastion of natural female government, the National Party, have only two women, or 9% among their 22 senators and members. A lack of female representatives and the changing role and changing perceptions of the role of women in society mean that the vote for the Liberal Party among women has fallen over time. ‘Since 2001, the number of female Liberal MPs has been falling, which has coincided with a decline in the number of women voting for the party. Analysis by the Australian Election Study of the 2016 Election found 7% more women voted Labor than men. Essential pollster and Guardian columnist, Peter Lewis, has suggested the gender voting gap explains Labor’s lead over the Coalition since the 2016 Election. He says if it were not for women voters ‘the contest would be line ball’. This is because men are split 50/50 on a two-party preferred basis between Labor and the Coalition while for women the figures are 56% for Labor and 44% for the Coalition. The problem for the Liberals is only likely to get worse. The Liberal Party always has a number of female candidates but they are often in marginal or unwinnable seats. The Liberals overwhelmingly preselect men for safe seats. The problem is so bad that analysis by David Crowe in the Sydney Morning Herald showed that on current voting trends, the Liberals could end up with just five women in the House of Representatives after the May 2019 Election. The Labor Party has more or less solved the gender imbalance problem with quotas — the end result of 25 years of quotas is a Labor Party Caucus today with 48% women. Of course, having women in positions of power to manage capitalism does not mean that women workers and poor women benefit. To take but one example, on the same day former PM Julia Gillard was lambasting thenOppositionn Leader Tony Abbott in her famous misogyny speech, her government announced big changes to the single parent allowances, slashing payments to 100,000 people, of whom about 90% were women. As I wrote in the Sydney Morning Herald at the time, this was systemic misogyny — and it infects Labor in its managerial role for capitalism as much as it does the Liberals. The solution to the oppression of women in society will not come about because there are more women in Parliament running the very system that oppresses women. It is like imagining having more women on the boards of big businesses will give us a gentler, kinder type of capitalism. Real liberation will come about – as the last 50 or so years of the Women’s Liberation Movement and Women’s Movement have shown – through struggle. That struggle will be for immediate demands, like better and cheaper childcare, equal wages, more working hours if wanted, an end to precarious employment, communal cooking and cleaning, free contraception, abortion on demand and so forth. In the immediate, however, lies the future. Our collective strength as workers can create the conditions for a better world for women here and now, and open up the possibility of a new world in which the oppression of women is but a memory of history. Those immediate demands to make life better for women, which Labor is more or less silent on, can only be won if we mobilise. Over to you, Sally McManus. Over to you, rank and file trade unionists. You can follow Canberra correspondent John Passant on Twitter @JohnPassant. Signed copies of John's first book of poetry, Songs for the Band Unformed (Ginninderra Press 2016), are available for purchase from the IA store HERE.